The SuperFriends were one wacked-out introduction to classic superheroes. They were superhero tales as if they'd been approved by your mom, with none of the dark origin stories or troubled humanity of the comics. I think as kids we were supposed to identify with the kid characters, WonderTwins Zan and Jayna (and Gleek) or Wendy and Marvin (and Wonderdog). But no one ever did -- they were just handy hate fodder. 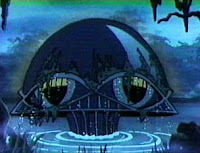 My real fandom was reserved for the Legion of Doom. Seriously, how cool were they? Their head-shaped headquarters rose out of a swamp and could fly if needed. The villains themselves were all flavors of messed up, including the barely English speaking Solomon Grundy, a swamp ZOMBIE, and Gorilla Grodd, a superbrainac gorilla. Just read some of the descriptions on the Wikipedia entry: "Toyman: Dresses as a jester; uses toy-based tactics to commit crimes." There are some great YouTube clips from SuperFriends, and the comments with them are just as hilarious as the show itself. One person wrote: "It's like every minute of this show was written by a separate group of people who never speak to each other."